Campaign committees for Democratic Sen. Kamala Harris (Calif.) twice paid tens of thousands to campaign committees for Democratic Rep. Maxine Waters (Calif.) in exchange for placement on a mailer announcing Waters's endorsement of Harris, according to Federal Election Commission records. Harris—who has garnered media attention and earned speculation that she is positioning herself to run for president in 2020 following her performance during recent Senate hearings, including that of former FBI Director James Comey—has kicked $63,000 to the campaign of Maxine Waters, the congressional face of the anti-Trump movement, in exchange for placement on the endorsement mailers. The payments were made from Harris's campaign committee and transferred to Waters's campaign committee through a lucrative "slate mailer" operation run by Waters's daughter, a program that has proved profitable for both her daughter and the campaign. On May 5, 2010, when Harris was a San Francisco district attorney and running for attorney general in the state, her campaign committee, Kamala Harris For AG 2010, paid Waters's campaign committee, Citizens for Waters, $20,000 to appear on her slate mailer announcing the endorsement. Harris made three payments totaling $33,000 to Waters's campaign committees throughout the 2010 election cycle. Harris won her election for attorney general. 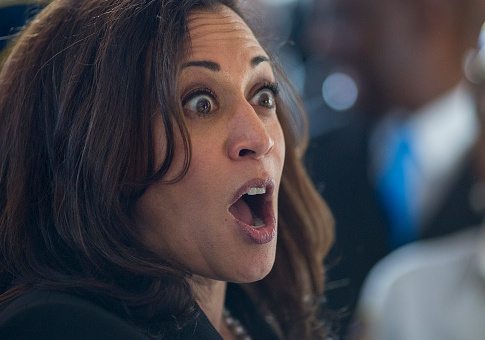 During the 2016 election cycle, as Harris was running for U.S. Senate, Harris's campaign committee, Kamala Harris for Senate, made a $30,000 payment in May 2016 to again appear on Waters's endorsement mailer. Harris trounced former Democratic Rep. Loretta Sanchez in the race to replace Barbara Boxer in the Senate. Waters's slate mailer operation is unique to Members of Congress but a more common practice in the state of California. The mailers list the candidates endorsed by Waters and is sent to the more than 200,000 constituents in South Central Los Angeles area, where the congresswoman holds considerable clout. The mailers contain an "official sample ballot" with brief quotes from the congresswoman. The operation is run by Karen Waters, the daughter of Rep. Waters, who has collected more than $650,000 to date for running the endorsement mailers. Karen is owed another $108,000 from her mother's campaign committee, according to its most recent records. Once Karen is paid, her total payments will reach more than $750,000 since 2006. The FEC issued an advisory opinion in 2004 allowing Waters to run the slate mailers from her campaign committee. Prior to running the slate mailers from her campaign, the operation was run from a state committee called LA Vote. The slate mailer operation, which legally allows Waters to bypass campaign contribution limits from other political committees, pulled in more than $300,000 for her campaign during the 2016 election cycle. Harris's $30,000 payment was one of the highest made to Waters throughout the cycle. Waters appears to be the only Member of Congress to run such an operation. Harris's office did not return a request for comment on the payments by press time. This entry was posted in Issues and tagged California, Kamala Harris, Maxine Waters. Bookmark the permalink.